Asthma is a disease that affects the lungs and the airways. People affected by this condition may feel difficult to breathe. Children whose parents have asthma have greater chance of affecting it. The allergic response: Asthma and allergies always occur together. Children and adults who have allergies at peak point can have asthma. Allergens may cause the immune system to overreact. Certain allergens such as dust mites, animal dander, molds, and even cockroaches, pollen from the plants, etc., may cause allergic asthma in children. Environmental Factors :If the child is allergic to more indoor allergens, she/he may has severe asthma. The important irritants include- indoor chemicals, air pollution and smoking, food allergies, etc. Infections: There are some infection viruses which may cause cold. It can be the reason of the development of asthma in some children. Patient education: The patient should be capable of self-monitoring and managing asthma. The parents should get proper training from the doctor. Controlling environmental factors and other asthma triggers: The parents should try to keep little children away from factors that trigger asthma. Asthma can also be controlled by treating the co-existing chronic conditions. Asthma can be managed in different ways. The right method can be suggested by the doctor according to the condition of the child. 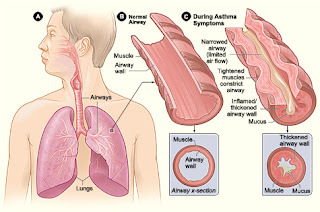 Fayth Clinic provides Best Treatment for Asthma in mumbai with help of expert doctors and other staffs.